Turnkey Solutions Designed for Temporary Traffic Management Roadworks. At Roadside Technologies we have a range of Temporary Intelligent Transport Systems (I.T.S) designed for use within Highways Traffic Management. We have a range of systems for hire designed to inform and safely manage motorists through Highways Traffic Management. All systems run wirelessly and operate indefinitely via solar power, meaning no existing infrastructure is needed. 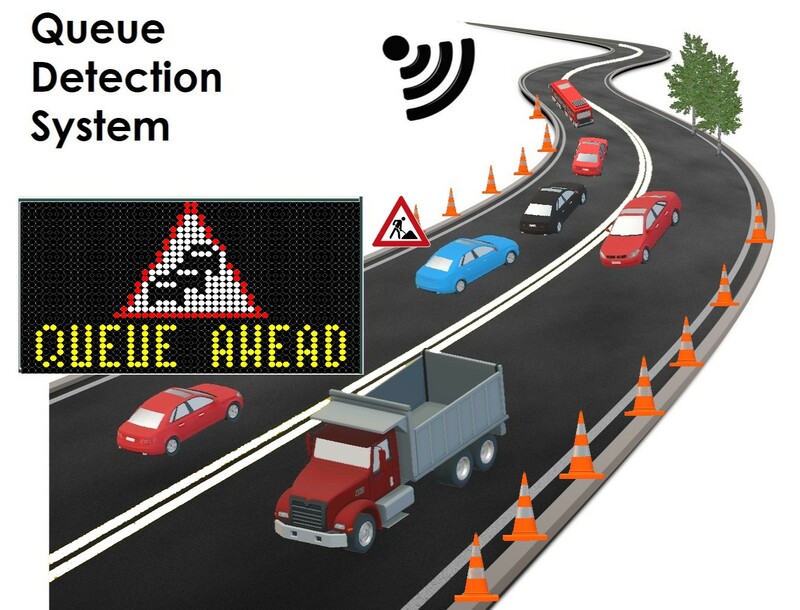 Systems such as Queue Detection, Average Speed and Lane merging can be safely installed and operate automatically. With the use of our smart sensors positioned at strategic locations throughout your site, the sensors can continuously measure traffic flow and speed. Data can then be streamed via 3G/4G or Wi-Fi. Once in the Roadside Cloud, the server can then calculate the appropriate message to be written on our VMS-4 Variable Message Sign which can be installed prior to the road works. The VMS-4 can warn motorists in advance of the works for delays or stationary traffic ahead. Each trailer is battery powered with solar backup to offer continuous operation throughout the year without needing to be recharged. The system is a very cost effective method against installing Average Cameras which use ANPR (Automatic Number Plate Recognition). One key benefit is that system can be installed and tested on a live motorway and no full closures are needed. The QDS is a temporary solution which is operational within a few minutes. Entering the flow of traffic on a high-speed road can be a challenge for HGVs and site works vehicles. 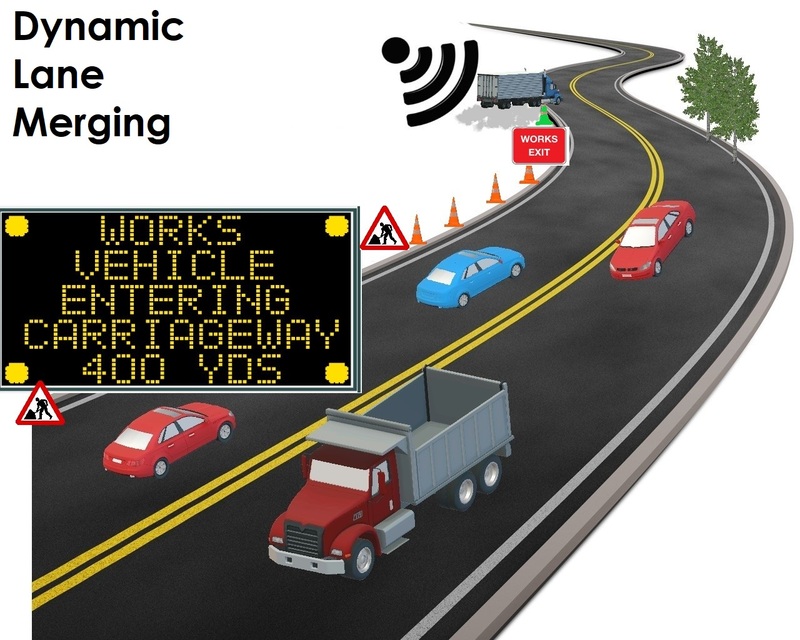 Our DLM system can minimise the risk by warning vehicles in advance that a vehicle is joining the carriageway. This is a temporary solution and works by placing a vehicle detection sensor on the entry slip joining the carriageway. Our VMS-4 Variable Message Sign would then be positioned prior to the entry slip. Any vehicle travelling on the slip would be detected and a warning message activated on our VMS-4 to allow motorists to change lanes or prepare for the trucks entering the carriageway ahead. The VMS-4 solar powered Variable Message Sign can display up to 4 lines of text depending on the road speed allowing for a customised message for each individual site. The DLM can be overridden remotely should the automated system need a different message displaying. Informing and monitoring vehicles through long stretches of temporary Highways Traffic Management. With the ability to inform motorists in real time of the approaching road conditions ahead, this allows them to make informed choices and avoid any approaching delays. Our VMS-4 Variable Message Sign is fitted with a PIPS Spikelet P392 camera which will record passing vehicle registrations. Another P392 camera is fitted to a Solar Auxiliary Trailer (SAT) toward the end of the road will also take an image of the registration and stream this information to our RDS (Roadside Data Server). The RDS will then calculate journey times between the two points from the vehicle registrations and display the Journey Time taken at the two points. 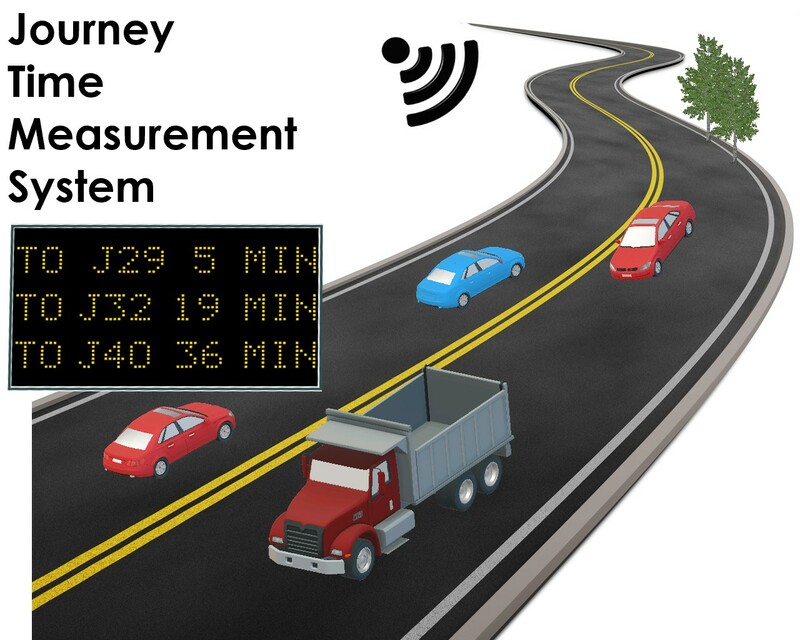 ANPR JTMS is an accurate and proven technique in measuring traffic point to point. The system is fully autonomous and will update our VMS-4 day and night to offer a true temporary solution for your site. JTSM is also available using Bluetooth and an online cloud based data collection.